And my habit of taking pictures of people taking pictures…continues. For third time in as many days, we found ourselves waking up far earlier than we would normal expect to on vacation. But this time, it wasn’t merely from jet-lag or from having to catch some sort of transit to the next town, it was to see one of the great sights in the world, the Taj Mahal. I feel like anything I can write on the matter has either been written, or doesn’t do the impressive structure any real justice. Often, world-renowned sights are not nearly as impressive in real life as in they seem to be in guidebooks. But occasionally, no amount of adjectives are actually befitting the building many a weary traveler has come so far to see. This is definitely the case with the Taj Mahal. We decided to not be the kind of tourist that goes directly from the bus or train station, see the Taj, and then book it back to Delhi. Instead, we first booked ourselves into the Friends Paying Guest House, with an extremely helpful and excitable young manager. He suggested that we see Agra Fort first, so we headed back out into the stifling Indian sun. The fort—made from the same red sandstone as the Red Fort in Delhi—was quite impressive in its own right, far more so than its brethren to the north. We wound our way around the fortress grounds, until we arrived at a terrace with a stunning view of the city’s main attraction. Like a switch, our attention was completely turned away from the beauty of the fort, to the far more impressive Taj Mahal. Even at a distance, its beauty is enough to have stopped us at our tracks. From that point on, it was pretty much all-Taj, all the time. We quite literally couldn’t get enough of it. We saw it from the west, the south, the east, and the north, as well as toured for hours inside its grounds. After Agra Fort, we went to a rooftop restaurant just south of the Taj Mahal to enjoy a couple of beers and watch the sunset. The walk from our hostel to the Taj Mahal was short, but the temperature was already beginning to climb steadily at 7 AM. On the way, we stumbled across a coffee shop which was almost as welcome a sight as our final destination. There, standing with our first–and so far only–coffee, we mulled over what we should see, other than the obvious, on our last day in Agra. A man approached us to offer his services as a tour guide. We would have taken him straight away, but his English was barely passable to me, and completely indecipherable to Christine. Instead, we declined, figuring that we would find one inside the gates. That assumption proved correct, and our new guide was very knowledgeable and (almost as important) easy to understand. He also played to our tourist sensibilities by carefully guiding us through each important photo opportunity. 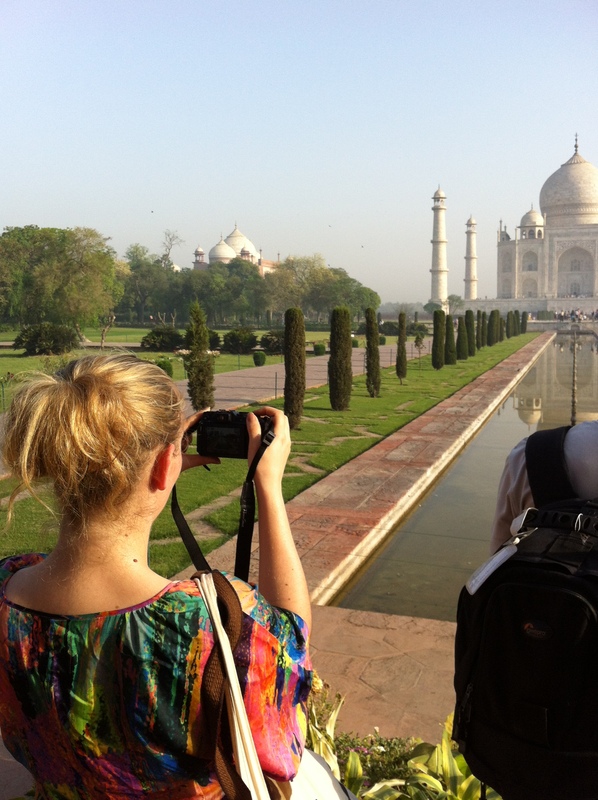 With each step across the well-manicured grounds, the Taj Mahal become more and more impressive. The intricate detail of each and every square inch of surface is almost too much to take in. Actually, correction: it is too much. From the giant slabs of marble to the tiniest stone inlays, the building was about as perfect as could be. We did a couple of loops around the great structure, before finally finding a spot to sit in the shade. We gazed admiringly at it for a long time before finally gaining the will to leave. 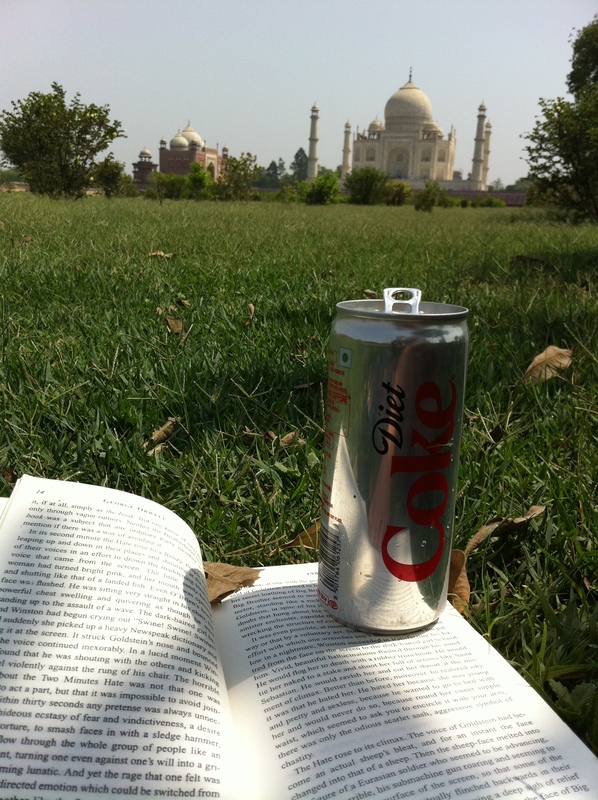 Unfortunately, we still had quite a bit of work to accomplish before we could leave Agra. We needed to get down to the train station to purchase tickets to our next destination, Khajuraho (pronounciation still unknown). Now, nothing in this country comes easy, and we had two handfuls of hassle in dealing with both our tuk-tuk (motorized rickshaw) driver and the attendant at the ticketing counter at the station. First, our driver refused to take us to the closest station, saying that we needed to go to the further one to buy the ticket. This was precisely not what our hotel manager had told us, so we insisted. He pulled over and a good five minute argument ensued. Finally, he relented, but then he refused to take our money until we made sure we were at the right station. He waited patiently for us while we went inside the station to buy tickets. And it must have been patiently, as it took us nearly a half an hour–most of it spent arguing–to buy the tickets. This is one of many reasons that Christine is a good travel partner to have around. Whereas I would have turned tail with a confused look on my face, searched for a few hours, and then finally paid too much for the ticket, she took care of the problem right then and there. It wasn’t the overnight ticket that we sought, but it got us to our destination, so we paid him and headed back to the driver. Once again, our driver wouldn’t take our money, but instead suggested a (very out of the way) park. We were hesitant, but wanted to spend the hottest part of the day in the shade. When we arrived, one thing became painfully clear: there was no way to get back to the city center from this point unless we paid our driver to wait around for us. This guy had swung for the fences and connected big-time with us; he wasn’t interested in a single, he wanted a home run. Reluctantly (and realizing the position were were in) we agreed to let him take us around for the rest of the afternoon. At this point, it’s almost painful to admit, but this park was fantastic. It was far away from the honking horns and dirty city streets, and best of all, right across the river from the Taj Mahal. We sat under the shade of a tree, felt the grass under our feet, listened to the birds sing, and read with one of the great sights of the world just beyond the top of our books. We were told to meet the driver back at the entrance at 3 o’clock, and from there he proposed driving us around to a few shops. We steadfastly refused, and it was my turn to lose my temper. Unlike Christine’s well-timed fury, mine made no difference whatsoever. “I take you one more” wasn’t a question, it was a statement. When he pulled up to the last store, we sighed, rolled our eyes, and looked around the store for a few minutes, and left without buying a thing. He agreed to take an insignificant amount off our fare because of this last stop, and then got mad when I asked him for correct change (thus not tipping him) at the end of our journey. 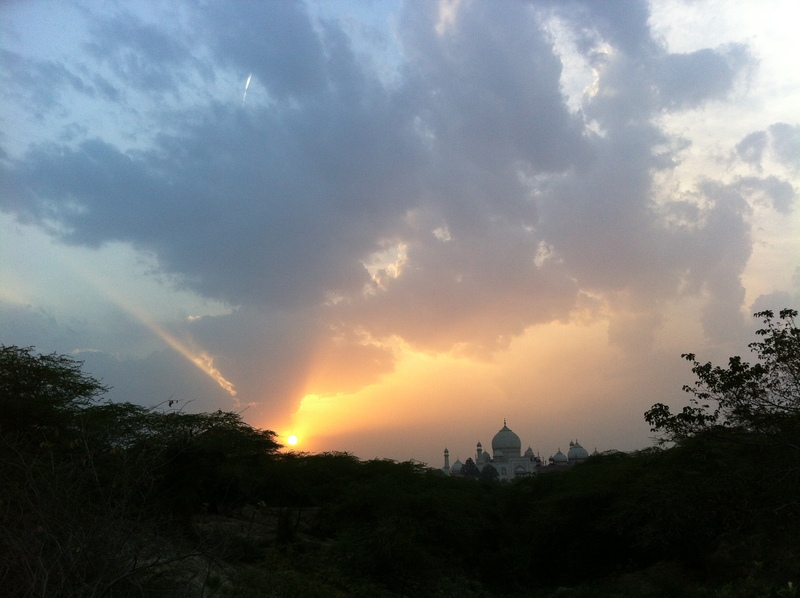 With stresses of the train ticket and tuk-tuk driver behind us, we set our sights on one last thing to do in Agra, seeing the Taj Mahal at sunset. Having already seen it from north, west, and south, we needed to find a good vantage point for the finale. After a great deal of searching, we found an incredible and incredibly sparsely populated park with a fantastic view. Slowly, the sun burned through the lower reaches of the atmosphere, lighting the sky with the full spectrum of colors, until it dipped below the horizon and we had to leave the park. We said one final good-bye to our friend, as its silhouette stood as impressive as ever against the purple sky.